The '800 Challenge' - Southern Africa: Go camping, it's fun.. The best trips are often 'spur-of-the moment' decisions and half the fun, usually, is anticipating the unexpected. We decided that a weekend away to the Kruger National Park would prove just the tonic for our JHB-wearied spirits. Anybody who has ever tried to book a last minute trip to the KNP will tell you that securing accommodation is virtually impossible, always fully-booked well in advance either by booking agents and or by self-drive travelers, local and foreign. Getting specific accommodation i.e: at a chosen camp, is even more difficult. We wanted to stay at Satara, our favourite camp in the central Kruger, famous for its sightings of lion and other big game. As expected, the camp was fully-booked. There was, however, some 'camping' availability. 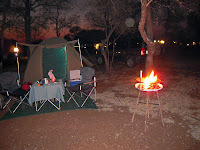 We're not new to camping having over-landed in most of Africa's wilderness areas which require total self-sufficiency. Camping in the Kruger though had, until now, seemed 'unnecessary'. The park's formal accommodation is perfectly adequate and well-priced, generally. Given no option, however, we packed a 'three-day katundu' [camping equipment to see us through three days] and set off a little later than expected on Friday morning. We eventually found the perfect spot well away from halogen lights and the clamour of miniature-satellite-dish assisted television [??] and set up our little canvas dome-tent and some chairs. 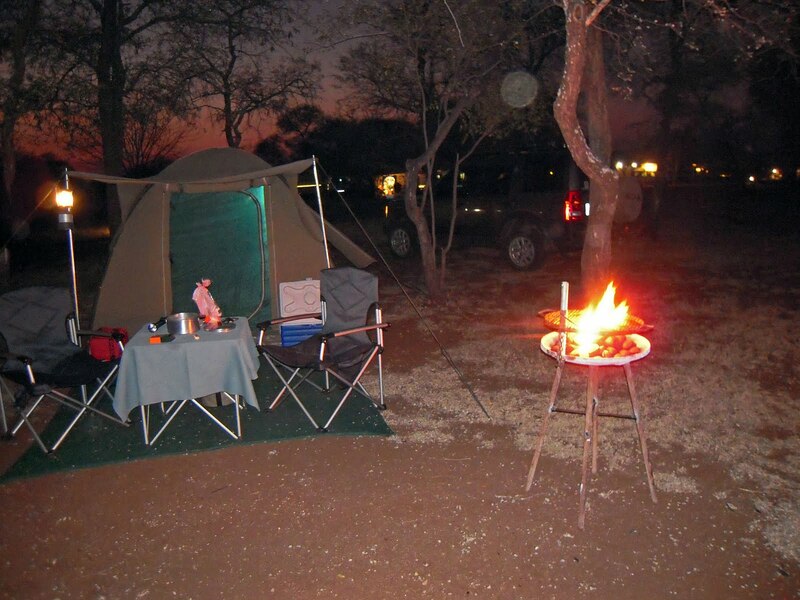 Our second lesson in 'Kruger-camping' became obvious when our grumbling stomachs hinted that it was time to light the fire... There wasn't a braai-stand to be found anywhere! Some of our fellow 'campers' had commandeered two, sometimes three, braai-stands. It takes a LOT of wors ('sausage'), it seems, to feed some of those boys... Housekeeping fortunately found and delivered us a spare braai-stand. Annoyingly though, the grid was befouled with old grease and grit. Take a brush or your own grid, another lesson. A crackling fire is considered medicine for the soul and this night was no different. Scops, White-faced and Barn Owls called quietly in the dark. The distant roaring of a lion was almost, but not completely drowned-out by drunken laughter from the nearest chalets [...yes, it's not ALWAYS the pesky campers that make the most noise] (BTW: KNP authorities have banned the sale of alcohol to non-residents, a BIG thumbs-up! You'll see fewer cans littering the roadside and better behaved visitors at the picnic sites. Now for those unnecessary 'day-trip safari vans'....). The most unnerving aspect when camping in the Kruger is the enforced use of the communal ablution facilities. Shades of plague-ridden nightmares past conjure up images of filthy pans and mud-splattered baths all of which usually haunt the first-time camper. This is, however, not the case. We found the ablutions clean and orderly. Besides the precautionary and obvious need for foot-gear, there's nothing 'grim' about the ablution facilities; our forth 'Kruger-camping' lesson. The 'old-timers' will remember years gone by when strangers met around a fire to discuss the day's events; what was seen, where and when. Some formed lasting friendships. Interestingly, those days still exist in the campsites of Kruger.